KREATOR - ENDLESS PAIN REMASTERED (CD) | Online Shop | Wizard LTD. 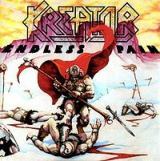 Album: "ENDLESS PAIN REMASTERED (CD)"
Endless Pain is the debut album of the thrash metal band Kreator released in 1985 by Noise Records. It is noted as the only Kreator album that does not have Mille Petrozza on lead vocals. Drummer uьrgen Reil sang on the album instead, due to Mille's lack of proper vocal training (though he still did vocals on about half the songs on the album). This album has been known to be viewed upon as a pivotal album to black metal bands that enjoy dabbling in the thrash metal elements, ultimately creating a thrash-influenced black metal sound. It is also considered by some to be a precursor to death metal.